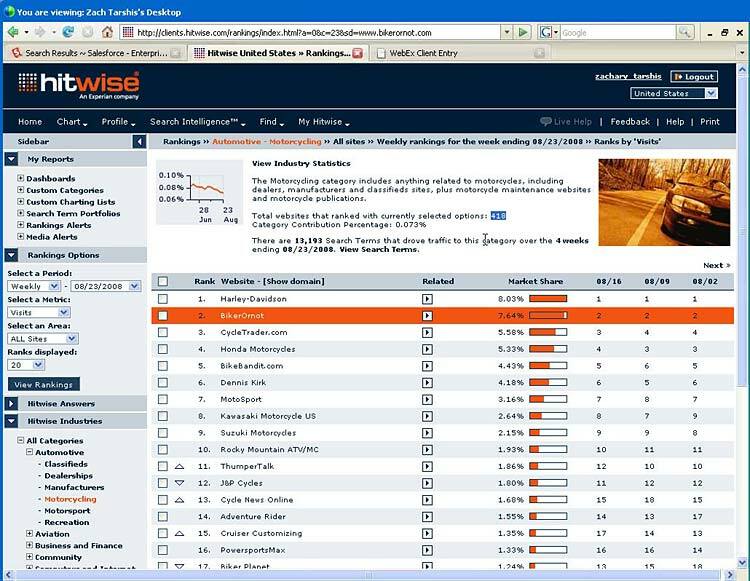 A sales rep from Hitwise called the BON office to give us a demo of their analytics package. We ran a few reports and there were some big surprises. According to Hitwise, BikerOrNot is the second largest motorcycle site in the world — second only to Harley-Davidson. Here is the screenshot of the report. Looks like H-D is only a bit larger than us right now. I have a girlfriend riding to DelMarVa bike week at the beach this evening after work on her bike, by herself. She is looking to hook up with someone to ride with….Anyone available? BikerOrNot is the best website in the World in my book.Not only have I met some of the best and baddest bikers in the world,informative articles of recognition goes with out saying! Since overcoming the initial technical hiccups, we BikerOrNotters (BONers) have been happily browsing along over the past several months. H-D ought to take a good look at this site as it is geared to pass on to #1 very soon. I would suggest a partnership, and although I’m just a rider I know one way I can spread the idea of unity like a lot of other riders do is to display my BON patch on my vest. The next step is to join up with the continental rides if I can ever get off this rock! Kudos to the staff at BON for providing such a wonderful service! I have not tuned in recently, I miss ya BON. I have met some dear friends and looks like the man of my life also! I have supported BikerorNOt tent areas for rallies and enjoyed every minute of it. If my plans go like I want I will be having a BikerorNOt wedding! We met on Bon and feel like the only way to have the proper wedding is to have the theme be BikerorNOt!!! Wanted to give ya’ll some BIG ol’ pats on yer backs for building such a great site! And it’s #1 in our books, but nice to see that your second from the top according to that social networking site… CONGRADULATIONS! A friend of mine in Ca. turned me onto your site, and when i researched it I found we’re basically neighbors!!!! Ha COOL!!! Keep up the Good Work… and I keep on Promoting your Site!!! I have been a member for a while now and have enjoyed it. It is probably the best biker related social networking site out there. I’ve met some beautiful sister’s & brother’s on here. Still meeting more. I may be old but if we had this stuff in the old day’s thr’dbe a hell of a lot more of us. Brotherly Love to U all. It’s rare for me to find something on the net that’s as entertaining and intriguing as what you’ve got here. Your page is lovely, your graphics are great, and what’s more, you use reference that are relevant to what you are talking about. You’re definitely one in a million, great job! Hi; Nice informations for me. Your post has valuable infos. I want to has valuable posts like yours in my blog. How do you make these posts? Hello; Great post for me. Your post has valuable infos. I wish to has valuable posts like yours in my blog. How do you find these posts? Hello; Excellent post for me. Your post has good quality. I want to has good posts like yours in my blog. How do you make these posts? Hi; Excellent post for me. Your post has good quality. I wish to has good posts like yours in my website. How do you find these posts? Just desire to say your article is as amazing. The clearness for your post is simply great and that i could think you’re an expert on this subject. Fine with your permission let me to clutch your feed to stay updated with impending post. Thanks 1,000,000 and please keep up the enjoyable work. doing so is too accurate, cant assume it. Properly Delivered! Do you have an issue with spammers comment spamming on your blog? Click http://is.gd/BrNJlt for the solution. I like the helpful info you supply for your articles. I will bookmark your blog and check once more right here frequently. I am fairly sure I will be told a lot of new stuff proper here! Good luck for the following! Hello there, simply changed into alert to your blog via Google, and found that it is truly informative. I?m going to be careful for brussels. I?ll appreciate if you continue this in future. Numerous folks might be benefited out of your writing. Cheers!